This article was first published by Business Day Live on 25 November 2015. There is a business product with a proven rate of return in excess of one thousand percent in emerging markets. In South Africa, demand for it outstrips supply by at least two to one. Estimates are that the national GDP would be at least 25% higher if this product were available in sufficient quantity. Yet, very few companies seem genuinely interested in it, because they don’t see it as part of their business. That product is the ability to read. There are a few companies that have cornered the market, by incorporating the product into a private school offering. But I’m talking broader than that, about the investment of business in South Africa Inc. In 2010, the Department of Economics at the University of Stellenbosch estimated that South Africa’s economy would be 23 – 30% larger if we had a fully literate population. International studies show that investment in early learning and language development would yield a return of between R8 and R18 for every Rand spent. The logic is simple: the ability to read and understand is the basis for learning; learning is the means to education; and education drives a knowledge economy. With only one in five children eventually passing Matric and enrolling in tertiary studies, we just don’t have enough expertise to grow our economy. Of course, the ability to read is not a silver bullet. In order to achieve your full potential, you still need good schooling and post-school opportunities. But being able to read sets you on an upward trajectory that becomes exponential when these conditions are met. Those who can’t read well by Grade 4 – that’s at least half our children by even the most generous measures of competency – never reach that growth path and their potential fades away before they’ve left primary school. They become ‘unemployable’ and are the faces behind the large numbers of jobless, despondent youth. You’d think the case for reading was so compelling that every business in South Africa would make it their business too. But they don’t. It’s a classic case of market failure: everyone would benefit if we all got involved, but few do because the benefits accrue to society as a whole and cannot be captured directly for short-term private gain. Let me give a couple of examples. 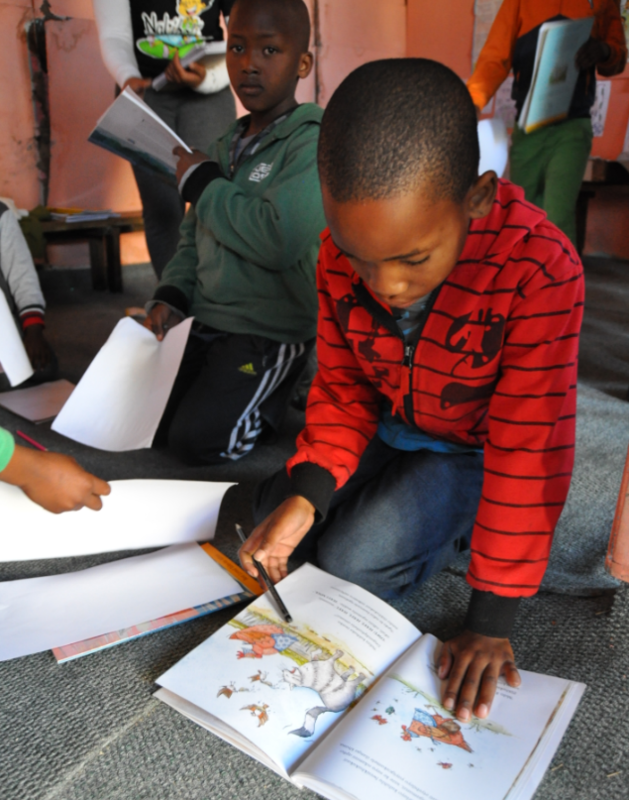 Nal’ibali is a national reading initiative that has developed a footprint of over 600 community reading clubs, supported by outdoor, radio and print media. One of its most valued products, in partnership with TimesMedia, is a weekly newspaper supplement. Over 6 million copies are printed every year. The supplement includes tips for parents and stories for children and is often the only reading material available in poorer households and preschool centres. The demand for it is huge, but the challenge is to find an affordable distribution channel. There is a simple solution. All that is needed is for one large retailer to distribute the co-branded magazine through its stores – made available on a small co-branded stand. We’ve approached Jet, Pepkor, Massmart, Boxer Superstores, among others, and the response is the same: That stand, with the free publications (paid for by Nal’ibali) would occupy a space in the store that could generate revenue. But, we are assured, the company does invest in corporate social investment, and we are invited to talk to the CSI Manager to see if she can help in some way. Another example: There are a number of mobile reading apps for young people. FunDza is one. It has over 60 000 readers who download stories, chapter by chapter on their feature phones or entry-level smartphones. It’s a fantastic opportunity to reach millions of young people who have no access to books. But its potential value is stunted by the high cost of mobile data. Again, there’s a simple solution. Network operators could zero-rate the costs to users for a range of public benefit applications such as FunDza, and offset those costs against their mandatory socio-economic development (SED) obligations. It’s a win-win situation, but it hasn’t been done. I suspect the reason is that network operators prefer to cut deals with selected non-profit partners to retain the kudos for themselves. There are some essential products that South Africa must produce to grow its economy. Every person, every household, every business will suffer if we don’t produce them. One of the most powerful, yet basic products is the ability to read. Its marginal cost of production is very low if companies were willing to use their distribution systems, retail outlets and occasionally even their own products to make reading material available. It would be great if there were a generosity of spirit, but if that is too much to ask, at least let’s see a longer-term commitment to business in South Africa. Thank you David Harrison for always ‘hitting the nail on the head’. An article I plan to share widely. Very proud to be associated with DGMT.